This is the study of the sound waves made by the human vocal organs for communication and how the sounds are transmitted. The sound travels through from the speaker’s mouth through the air to the hearer’s ear, through the form of vibrations in the air. Phoneticians can use equipment like Oscillograms and Spectrograms in order to analyse the frequency and duration of the sound waves produced. This is how we perceive and hear sounds and how the ear, brain and auditory nerve perceives the sounds. This branch deals with the physiological processes involved in the reception of speech. 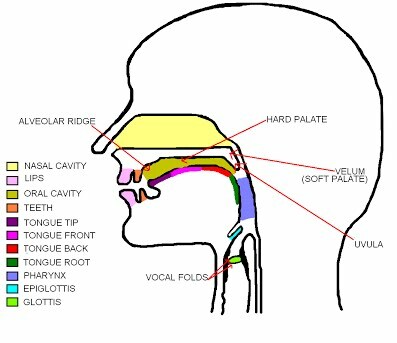 Articulatory phonetics is interested in the movement of various parts of the vocal tract during speech. The vocal tract is the passages above the larynx where air passes in the production of speech. In simpler terms, it is understanding which part of the mouth moves when we make a sound. A VPM label is a term that is used in phonetics, meaning Voice Place Manner labels. These labels are given to sounds, in order to describe where the sound is produced, how and whether it is voiced or unvoiced (voiceless). For more information, see Articulatory Phonetics. Saggital sections like this one show exactly where each articulator is. Try labelling articulators yourself with an interactive diagram of a sagittal section. The International Phonetic Alphabet (or IPA as it is commonly referred to) is a system set up to give symbols to all of the speech sounds that occur in all languages internationally. It is an alphabetic notation system, as one symbol corresponds to one particular sound. It was originally set up as linguists needed a system to transcribe sounds they heard, as the Roman Alphabet, whilst useful for spelling, does not account for different phonemes and their production. Pulmonic consonants are those that are produced by setting air in motion from the lungs. In English, we use pulmonic consonants to make consonant sounds. Along the top of the pulmonic consonant table, you will notice headings like ‘bilabial’, ‘labiodental’ etc. This column indicates the place of articulation; the place in the vocal tract where the sound is produced. Down the furthest left column, you will see labels like ‘plosives’, ‘nasals’ etc. This column indicates the manner of articulation; the manner in which the airflow, from the lungs, is modified by the vocal tract. Where the columns meet on the table, you will notice symbols. These symbols are produced at that place of articulation, and in that manner of articulation. For example, underneath ‘bilabial’ and to the right of ‘plosive’ you will see the box containing /p b/. The symbol on the left, in this case the /p/, is the voiceless sound, whereas the symbol on the right, the /b/, is the voiced sound. This is the same in all of the columns. From this we can take the labels: /p/ is a voiceless bilabial plosive and /b/ is a voiced bilabial plosive. The pulmonic consonants of the IPA – IPA Chart, http://www.internationalphoneticassociation.org/content/ipa-chart, available under a Creative Commons Attribution-Sharealike 3.0 Unported License. Copyright © 2015 International Phonetic Association. The quadrilateral shape, including symbols that you may recognise like i, and some that you may not, like ɛ, contains all of the vowel sounds used by languages internationally. The quadrilateral shape symbolizes the vowel space, i.e the mouth. The labels along the top of the quadrilateral, such as ‘front’ and ‘back’, describe the horizontal tongue position, which is where the tongue is horizontally positioned in the mouth for the production of that vowel. Therefore, for /i/, the tongue is the furthest front it can be for a vowel sound, whereas for /u/ it is the furthest back it can be. The labels along the left side of the quadrilateral, such as ‘close’ and ‘open’, describe the vertical tongue position, which is how far the tongue is from the roof of the mouth. Therefore, for /i/, the tongue is the closest it can be for a vowel sound, whereas for /a/ it is the furthest away from the roof of the mouth that it can be. The symbols around the outside of the quadrilateral are the cardinal vowels, as they are produced at the very edges of the mouth. The other symbols are produced with the tongue more towards the middle of the mouth. For example, /ə/ is a mid, central vowel, meaning it is produced with the tongue in the center of the mouth, both horizontally and vertically. 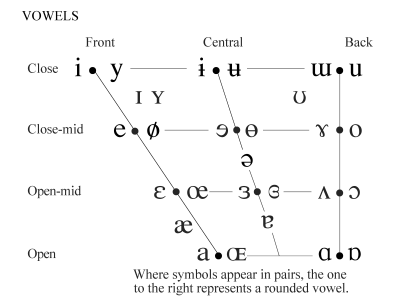 The vowels of the IPA – IPA Chart, http://www.internationalphoneticassociation.org/content/ipa-chart, available under a Creative Commons Attribution-Sharealike 3.0 Unported License. Copyright © 2015 International Phonetic Association. The phonemes (sounds) given above are those from Southern British English (SBE) which is similar to the Received Pronunciation (RP) accent associated with royalty and those of a high social class. Due to differences in accent, you might produce the words given with different sounds than those shown. For example, if you’re from the north, it’s likely that you will use the [ʊ] phoneme in both ‘look’ and ‘putt’, where SBE has two different vowels. That is just one of the many interesting differences between regional accents. For more information, check out th Dialectology page.